Why fUltrasound is a promising modality for neuroscientists working on small animal models ? 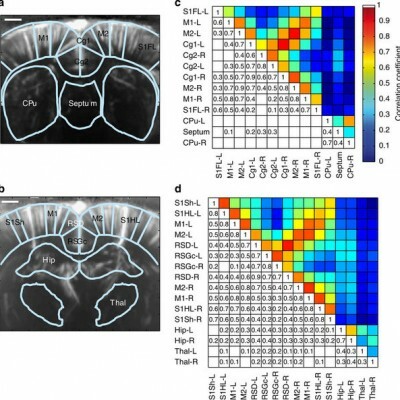 Because the technique is real time, portable and much cheaper than fMRI which can really accelerate the workflow of neuroscientists and neurobiologists. fUltrasound has been successfully tested on rats and rabbits and can easily be transposed to mice models. 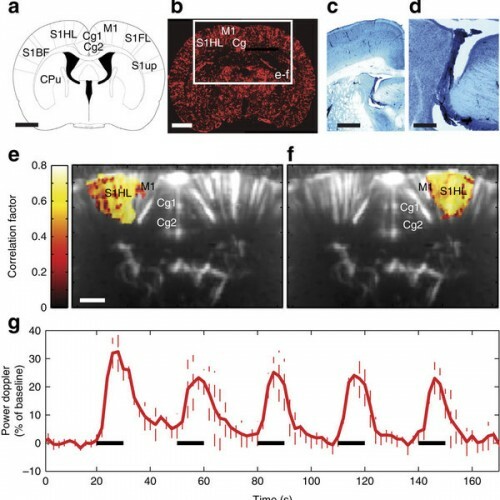 Advantageously compared to fMRI, it is quite easily possible to perform functional imaging experiments on awake and freely moving animals for behavioral experiments and 4D fUltrasound is already in development in our ERC project. The high framerate of the technique allows to sample resting state activity generously and obtain a large quantity of data. This translates in high SNR ratio and beautiful maps of the resting state activity in a few seconds. Influence of pathology and drugs. Thanks to its high spatiotemporal resolution, sensibility and portability, fUltrasound is a great modality for functional activity mapping. The technique has been shown to be capable of mapping the response of a single whisker stimulus, electrical stimulation of the hinderlimbs and even keeping track of odor processing in the olfactory bulb. Thinned skull protocol have also been developped for translational studies and ultra light probes for freely moving animals are being worked on. Functional ultrasound can be used to detect and map visual activation to study visual restauration and pathway. fUltrasound can be used to identifty structures involved in a cognitive process by correlating fUltrasound data with electrophysiology data. 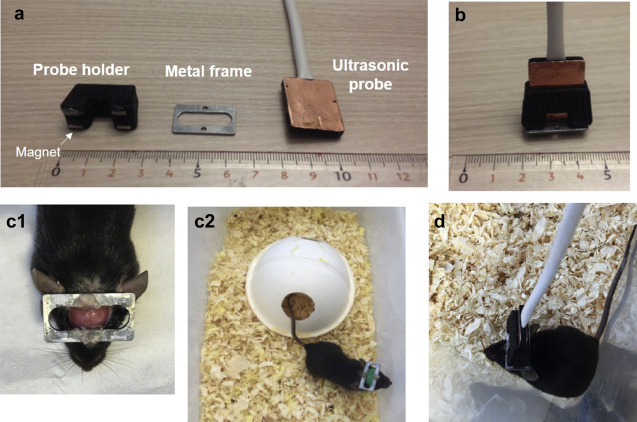 We developed an integrated experimental framework that extends the brain exploration capabilities of functional ultrasound imaging to awake and mobile rats. 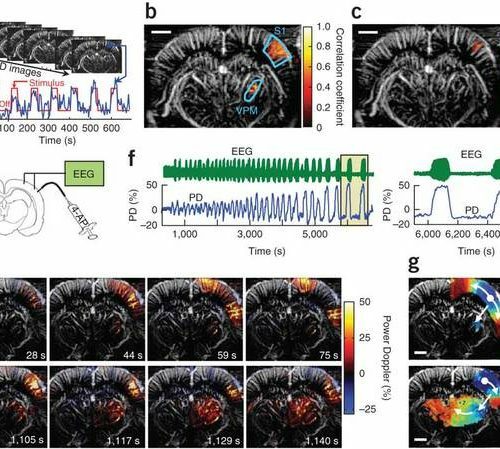 In addition to acquiring hemodynamic data, this method further allows parallel access to electroencephalography (EEG) recordings of neuronal activity. 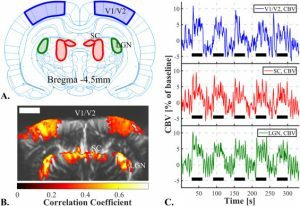 functional ultrasound can be used to track epileptiform seizure propagation and spontaneous absence seizure in awake rat. 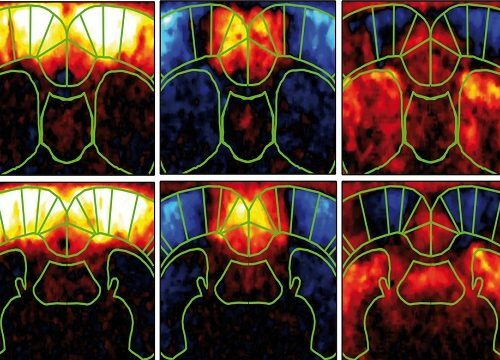 Transcranial images of the brain vasculature can be obtained in mice until 1 year of age and rats until 1 month of age, without requiring any contrast agent or invasive surgery. Our method was validated by imaging the brain activation as a response to whisker stimulation on awake and freely moving mice. We introduce a new imaging technique called ultrafast Doppler tomography (UFD-T) that enables 4D microvascular imaging of brain hemodynamics in rodentsby combining ultrasound ultraAngio4Dfast Doppler and tomographic reconstruction for 3D imaging. The technique reaches 100 μm resolution and is sensitive to very slow blood flow (1 mm/s) with 4D capabilities during one cardiac cycle and opens the way to 4D imaging. 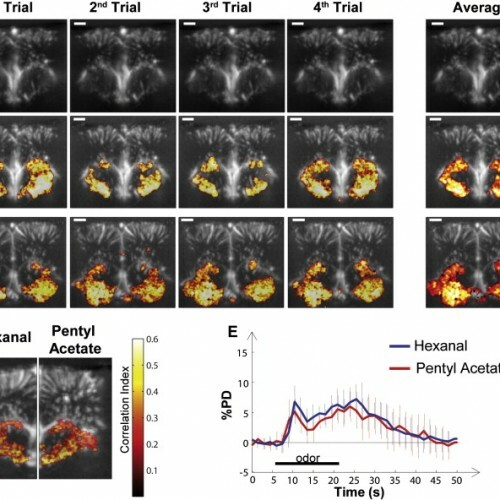 4D ultrasound microvascular imaging in vivo could become a valuable tool for the study of brain hemodynamics, such as cerebral flow autoregulation or vascular remodeling after ischemic stroke recovery, and, more generally, tumor vasculature response to therapeutic treatment.